1Instituto de Investigaciones Agropecuarias INIA, Casilla 3, La Cruz, Chile. "Corresponding author (rvargas@inia.cl). Latania scale, Hemiberlesia lataniae (Signoret), has become a major pest of avocado (Persea americana Mill.) in Chile and has reached high populations in the fruit because of limited natural control. The objective of this study was to identify the biological parameters of the parasitoid Aphytis diaspidis (Howard) as a control agent of latania scale. Postembryonic development, parasitoidism rate, and life table parameters of the parasitoid and scale were determined under laboratory conditions. Aphytis diaspidis postembryonic development and parasitoidism rate varied significantly when evaluated on distinct latania scale stages with the highest survival (56%) occurring at the third scale stage, it also had the shortest development time between egg and adult (19.14 d) and the highest parasitoidism rate (66%). The intrinsic growth rate (rm) was higher for A. diaspidis (rm = 0.099) than latania scale (rm = 0.068). These laboratory results demonstrated that A. diaspidis is an effective parasitoid for decreasing H. lataniae populations, especially in the third stage. Key words: Postembryonic development, life tables, parasitoidism, biological control, white scale, avocado. La escama latania, Hemiberlesia lataniae (Signoret), se ha transformado en Chile en una plaga de importancia primaria en palto (Persea americana Mill. ), donde alcanza altas poblaciones en la fruta debido al escaso control natural existente. El objetivo del presente estudio fue conocer parámetros biológicos del parasitoide Aphytis diaspidis (Howard), como agente de control de la escama latania. Es asi como se determinó en laboratorio el desarrollo postembrionario, tasa de parasitoidismo, y parámetros de tabla de vida del parasitoide y la escama. El desarrollo postembrionario y la tasa de parasitoidismo de A. diaspidis varió significativamente al ser evaluado sobre distintos estadios de la escama latania, alcanzando el mayor porcentaje de supervivencia (56%) sobre el tercer estadio de la escama, asi como el menor tiempo de desarrollo entre huevo y adulto (19,14 d) y la máxima tasa de parasitoidismo (66%). La tasa intrinseca de crecimiento (rm) fue mayor para A. diaspidis (rm = 0,099) que la de escama latania (rm = 0,068). Estos resultados de laboratorio muestran que A. diaspidis es un parasitoide eficaz en disminuir las poblaciones de H. lataniae, cuando prevalece el tercer estadio. Palabras clave: Desarrollo postembrionario, tablas de vida, parasitoidismo, control biológico, escama blanca, palto. Avocado production, Persea americana Mill. (Lauraceae), for export is greatly limited by pests such as trips and scales that mainly develop on the fruit at a high density and decrease marketable volumes (López and Bermúdez, 2007; Vargas and Rodriguez, 2008; Rugman-Jones et al., 2009). Scales belong to the Diaspididae family includes many species of important pests worldwide found in crops such as citrus, apple, pear, walnut, and ornamental trees (Claps et al., 2001; Mazzeo et al., 2001; Charles and Henderson, 2002; Apostolos et al., 2010). The most important diaspididae in Chile for avocado production is latania scale, Hemiberlesia lataniae (Signoret) (Hemiptera: Diaspididae), which colonizes the fruit and increases production costs by about 3% because it must be removed by brushing (Ripa and Larral, 2008). Chemical control is currently the most widely used against Diaspididae in avocado; however, insecticides allowed by buyer markets scarcely control this pest (López and Bermúdez, 2007). The most important natural enemies of scales throughout the world are ectoparasitoids of the Aphytis genus (Hymenoptera: Aphelinidae) (Erler and Tung, 2001; Japoshvili and Karaca, 2002; Murdoch et al., 2005). These parasitoids exert their regulatory action through oviposition and larval development in the scale's body and also by host-feeding in the immature stages. Moreover, it is characterized by a high capacity to adapt to perturbed and intensely managed agroecosystems as in the case of fruit crops (Matsumoto et al., 2003; Rojas, 2005). General habit parasitoids, including many Aphytis species, do not require a high scale population density to establish themselves on plants since they move to new areas through aerial dispersal in search of alternative hosts when there is a scarcity of primary hosts (Rosen and De Bach, 1979). Natural enemies associated with latania scale in Chile are the Rhyzobius lophanthae (Blaisdell) and Coccidophilus citricola Brèthes (Coleoptera: Coccinellidae) predators as well as the Aphytis chilensis Howard,! A. melinus De Bach (Hymenoptera: Aphelinidae) and Signiphora aspidioti Ashmead (Hymenoptera: Signiphoridae) parasitoids (Ripa and Larral, 2008). Both types of natural enemies released in high densities can provoke about 40% mortality of the scale population (Ripa and Larral, 2008). However, in their natural state, they are unable to exert the needed regulatory action to prevent economic damage produced by scales when they are in the fruit thus making it necessary to incorporate natural enemies to the agroecosystem to efficiently regulate pest populations. Before incorporating a new species or increasing an existing species in an agroecosystem, its biological and ecological characteristics must be known so as to estimate their potential as natural enemies on the pests (Chi and Yang, 2003; Bernardo et al., 2005; Eliopoulos, 2006; Liu, 2007). This can be achieved by constructing life tables which show population parameters of a species such as survival, longevity, reproduction, and oviposition (Maia et al., 2000; Speight et al., 2000). Furthermore, the physiological and morphological characteristics of each host stage greatly influence the parasitoid's biological parameters, and these relationships must be studied to predict their effectiveness as a natural enemy and establish the appropriate release time (Bernal et al., 1999). The specificity of parasitoids in controlling scales has been a characteristic that has been advantageous in Integrated Pest Management (IPM) programs in the United States and Europe and especially with parasitoids of the Aphytis genus (Apostolos et al, 2010). Both A. melinus and A. aonidiae control well Aonidiella aurantii Maskell and Quadraspidiotus perniciosus (Comstock) (Hemiptera: Diaspididae), respectively, and have achieved a 54% level of parasitoidism (Mazzeo et al., 2001). Furthermore, parasitoids of the Aphytis genus cause a high degree of mortality because of their host-feeding, especially in scale immature stages (Collier, 1995). Given the control potential that species of the Aphytis genus have on scales and the scarcity of natural enemies associated with latania scale in avocado, the objective of the present study was to identify the biological parameters of the parasitoid A. diaspidis (Howard) (Hymenoptera: Aphelinidae) and its host H. lataniae (Hemiptera: Diaspididae) under laboratory conditions. Aphytis diaspidis (Howard) was evaluated as a potential parasitoid of the Diaspididae Hemiberlesia lataniae (Signoret). The specimens of A. diaspidis partenogenetic were initially collected in the field in January 2007 from the Q. perniciosus scale (Comstock) in an orchard located in Limache (32°59' S, 71°16' W), Chile. After this, H. lataniae was bred on butternut squash (Cucurbita moschata Duchesne) in the laboratories of the Instituto de Investigaciones Agropecuarias (INIA) La Cruz, Valparaiso Region and then employed as host for A. diaspidis. The laboratory breeding rooms were maintained at 26 ± 2 °C, 65 ± 5% RH, 14:10 h (L:D) following the breeding techniques described by Rose (1990) and Matadha et al. (2004). Assays were carried out in the laboratories of INIA La Cruz between January 2006 and October 2007. 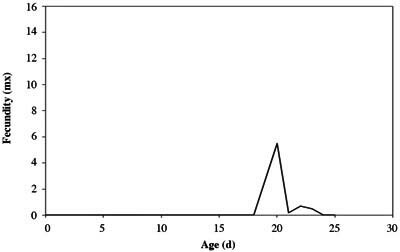 Nine-day-old H. lataniae individuals correspond to the first stage (1stS), 15-d-old to the second stage (2ndS), and 40-d-old to the third stage (3rdS) as pointed out by Blank et al. (2000). Each experimental unit consisted of a plastic ring (2.5 cm diameter, 1 cm height) bonded with inert glue to the butternut squash surface infested with a known number of crawlers that were then exposed to parasitoid adults. Subsequently, the top of the rings were closed with muslin to prevent parasitoids escaping and allow ventilation. Parasitoids were collected on the second day of emergence and were not > 72 h old because parasitoids < 24 h old have a low oviposition capacity (Heimpel et al., 1997). In addition, bee honey was maintained permanently as complementary food to increase reproduction (Heimpel et al., 1997). Observations of the experiments were made every 24 h with a 40X stereoscopic microscope (Zeiss Stemi 2000, Gòttingen, Germany). The effect of 1stS, 2ndS, and 3rdS of latania scale on the A. diaspidis female parasitoidism rate was determined. In an experimental area for 6 h, 10 individuals from each latania scale stage were added per female parasitoid and then oviposition of each female was recorded. One replicate corresponded to one A. diaspidis adult female, and 25 replicates for each stage of latania scale were carried out. Survival of A. diaspidis and H. lataniae was determined. A gravid A. diaspidis female was placed in an experimental area with 10 scales from the 3rdS fed butternut squash. After 6 h, the females were removed and 1egg/experimental area was left, which corresponded to one replicate; 25 replicates were carried out. When the parasitoid adults reached full development, they were left without food inside gelatin capsules to record their survival after emergence. For H. lataniae, a gravid female was placed inside an experimental area. One replicate corresponded to one gravid female, and a total of 25 replicates were carried out. Crawlers that emerged during the oviposition period were eliminated on a daily basis. A gravid H. lataniae female was left in the experimental area with a feeding substrate of butternut squash; this corresponded to one replicate and a total of 25 replicates were performed during the study. Crawlers that emerged during the oviposition period were recorded and eliminated on a daily basis from the experimental areas until the death of the scale was observed. For the A. diaspidis parasitoid, each 48- to 72-h-old adult was placed in an experimental area containing 10 latania scales from the 3rdS. One replicate consisted in one female adult and a total of 25 replicates were completed. Fecundity was recorded until the death of the parasitoid. The potential to develop from egg to adult of A. diaspidis and H. lataniae was established. The study was conducted in gravid females of the parasitoid and each one was placed in an experimental area with 10 scales from the 3rdS. Females were eliminated 6 h after inoculation and only 1 egg per experimental area was left. One egg corresponded to one replicate and a total of 25 replicates were performed. For latania scale, an experimental area with a butternut squash substrate was employed and a crawler was left to be observed on a daily basis to record the duration of each stage. One crawler corresponded to one replicate and a total of 25 replicates were performed during the study. Data obtained from the above mentioned experiments for both species were employed to calculate these parameters. The net reproduction rate (R0), intrinsic growth rate (rm), finite growth rate (X), and generation time (T), as defined by Birch (1948), were calculated with the Life Tables SAS program and Jackknife to calculate parameter variances (SAS Institute, 2007). Aphytis diaspidis had the highest parasitoidism rate when exposed to the 3rdS of latania scale (Table 1), but did not register parasitoidism with IstS diaspidid individuals (F = 135.687, gl = 2, p = < 0.0001). On the other hand, these results are consistent with Opp and Luck (1986), who reported that A. melinus and A. lingnanensis preferred the 3rdS of the Aonidiella aurantii scale to oviposite. The highest parasitoidism in the 3rdS is not surprising since large hosts provide an immediate resource for parasitoid larval development (Liu, 2007). This allows pointing out that the success of biological control programs based on the use of Aphytis must consider their release in periods that coincide with the highest density of the 3rdS of latania scale in the field. Along with this, it is proposed that a future study consider the effect of temperature on parasitoidism because the highest percentage was obtained between 20 and 25 °C in species such as Trichogramma turkentanika Meyer (Hymenoptera: Trichogrammatidae) (Hansen and Jensen, 2002). This could be a determining factor when it is released in the field in zones where the temperature could have an impact on a low or null reduction of the pest. Table 1. Aphytis diaspidis parasitoidism rate on distinct Hemiberlesia lataniae stages. *Mean on the same row with different letter differs according to Tukey Test (P < 0.05); SEM: standard error of the mean. In addition, a high mortality percentage was observed associated with host-feeding on the 1stS and 2ndS of latania scale. On the one hand, this reveals that the feeding behavior of the parasitoid would help the control of immature stages in the field and, on the other hand, could increase the presence of the parasitoid since it contributes to increased egg production (Giron et al, 2004; Rivero and West, 2005). Similarly, Burger et al. (2004) determined an increase in the life expectancy of the Encarsia formosa Gahan (Hymenoptera: Aphelinidae), parasitoid because of this feeding strategy, which also increased the number of eggs when fed honey. Heimpel and Rosenheim (1995) point out that host-feeding is a very good strategy in young individuals or in species with low egg production. Giron et al. (2002) point out that sucrose and trialose in the host would be mainly responsible for the increase in female longevity. This behavior would not have any significant effect on males because they would obtain their sources of food in less time than the females (Rivero and West, 2005). Further laboratory and field studies would be relevant to determine the importance of host-feeding on reducing scale populations. Aphytis diaspidis and H. lataniae females showed gradual mortality over time, which can be attributed to death by natural aging of the individuals (Figures 1 and 2). Figure 1. Aphytis diaspidis female survival curve. Figure 2. Hemiberlesia lataniae female survival curve. 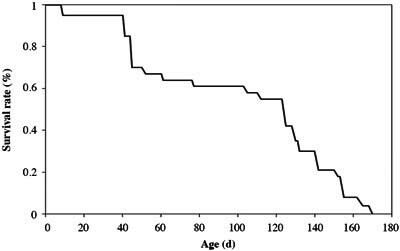 The two species demonstrated a type I survival curve, i.e., mortality was concentrated in older individuals. The A. diaspidis individuals started to die from day 14 until day 24 and showed a sharp drop on day 21. Meanwhile, H. lataniae specimens started to die on day 10; however, there is a sharp decrease on day 56 that continues gradually until day 169. Latania scale manages to reach a survival rate about seven times higher than the A. diaspidis parasitoid and determines the time needed in the field between releases. 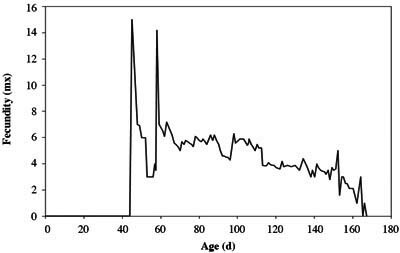 In the ectoparasitic species Mastrus ridibundus (Gravenhorst) (Hymenoptera: Ichneumonidae), higher longevity was observed in females that were fed than those that received little food (Bezemer et al., 2005). It has also been determined in the Eupelmus vuilletti (Crawford) (Hymenoptera: Eupelmidae) species that host-feeding increases both longevity and egg production (Giron et al., 2004). As a result, a greater availability of females could occur over time when there is food, but this is not necessarily associated with an increase in the parasitoidism rate. The highest fecundity value recorded for latania scale occurred between days 46 and 58 (Figure 3), unlike A. diaspidis fed on the 3rdS of latania scale that had maximum values on days 20 and 21 (Figure 4). This study does not analyze the increase in fecundity as related to female size or host nutritional status, which could influence an increase in the oviposition period. The increase in fecundity is determined by the quantity of lipids that promote egg production (Giron et al., 2004). Parasitoid females use a great quantity of reserved lipids during the first 24 h of life, which could be a limiting factor mainly in the smaller females (Rivero and West, 2002). In some species, larger females produce a higher number of eggs and a higher egg maturation rate (Bezemer et al., 2005). In A. melinus fed with Aspidiotus nerii, it was determined that an increase in reproductive activity would also occur with an external food supply with sugars (Heimpel et al., 1997). This is how sugars, complemented with the supply of pollen, increase longevity and fecundity in species of the Trichogramma genus (Zhang et al., 2004). This effect is common in predatory mites of the Phytoseiidae family such as Typhlodromus pyri where some Brassicaceae species have increased female longevity and fecundity (Bermúdez et al., 2010). Similarly, the food's nutritional value plays an important role in assisting flight and increasing their search capacity (Rivero and West, 2002; Wanner et al. , 2006). That is why plant species with flowers providing nectar are very important under field conditions. Figure 3. Female fecundity curve of Hemiberlesia lataniae fed butternut squash (Cucurbita moschata). Figure 4. 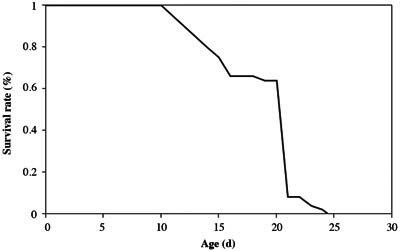 Female fecundity curve of Aphytis diaspidis fed 3rdS of Hemiberlesia lataniae. The A. diaspidis parasitoid fed with the 3rdS of latania scale reached full development between larva and adult with a 56% survival rate (Table 2). On the contrary, it did not reach full development when fed with individuals of the 1stS of latania scale. Furthermore, A. diaspidis completed its developmental cycle significantly faster when fed with 3rdS of latania scale (F = 32.30, gl = 1, p = 0.0001) (Table 2). Studies conducted by Opp and Luck (1986) found differences in offspring mortality of A. melinus and A. lingnanensis parasitoids at distinct stages of A. aurantii scale and with a higher number of A. melinus individuals dying in small hosts. Table 2. Postembryonic development of Aphytis diaspidis under laboratory conditions at 26 ± 2 °C, 65 ± 5% RH, and 14:10 h (L:D). Aphytis melinus has an idiobiont behavior, i.e., it prevents further development of the scale (Heimpel et al., 1997), which also coincides with results for A. diaspidis in this study. The postembryonic developmental period in idiobionts is less than in koinobionts; conversely, they spend more time as adults parasitizing their host (Mayhew and Blackburn, 1999). Latania scale fed with butternut squash was fully developed from the 1stS to the 3rdS with an 84% survival rate (Table 3), which demonstrates that the substrate used for its development was adequate. Table 3. Postembryonic development of Hemiberlesia lataniae on Cucurbita moschata under laboratory conditions at 26 ± 2 °C, 65 ± 5% RH, and 14:10 h (L:D). It was observed that latania scale had a higher net reproduction rate (R0) and generation time (T), and conversely, lower intrinsic growth rate (rm) and finite growth rate (X) than A. diaspidis (Tables 4 and 5). Table 4. Life table parameters and statistics related to Aphytis diaspidis parasitizing Hemiberlesia lataniae on butternut squash (Cucurbita moschata) under laboratory conditions at 26 ± 2 °C, 65 ± 5% RH, and 14:10 h (L:D). Table 5. Life table parameters and statistics related to Hemiberlesia lataniae on butternut squash (Cucurbita moschata) under laboratory conditions at 26 ± 2 °C, 65 ± 5% RH, and 14:10 h (L:D). Parameters show that the A. diaspidis population grows 5.24 times in 16.87 d, i.e., for each female of the current generation, 5.24 females are produced in the following generation. Furthermore, each female on any one day will result in 1.1 females on the next day. Therefore, under favorable conditions, the number of females in the A. diaspidis population increases at a daily growth rate that could reach about 10% (Table 4). The net reproduction rate, or number of females for each female of a generation, was considerably higher for latania scale than A. diaspidis (Tables 4 and 5), which indicates its high reproductive capacity when fed butternut squash. Moreover, the net reproduction rate obtained for A. diaspidis indicates a low substitution potential for each female having latania scale as a host under laboratory conditions. The oviposition period of A. diaspidis was also lower than for latania scale. The intrinsic growth rate, defined as a population's capacity to multiply, was higher for A. diaspidis (0.099) than latania scale (0.068) (Tables 4 and 5). These results confirm the potential of A. diaspidis to control latania scale, as well as adapting well in field conditions with plum trees in the Limache zone where it is commonly attacked by Q. perniciosus, according with "unpublished data". Although the rm parameter was obtained under laboratory conditions, it is a fundamental indicator of the potential of parasitoids to control their hosts (Stenseng et al., 2003; Vargas et al., 2005) and suggests that the population reduction pattern could be maintained under field conditions, which represents a significant factor in regulating latania scale populations. However, this characteristic must be compared with that of other species such as A. melinus, A. chilensis, A. hispanicus, and Encarsia sp. that can use the same field substrate. Studies carried out by Borer (2002) point out that there is interspecific competition between A. melinus and Encarsia perniciosi, which are both A. aurantii parasitoids (Maskell), so that the success of biological control in the field could also be conditioned by other species. The finite growth rate was similar for both species and corresponded to 1.1 for A. diaspidis and 1.08 for H. lataniae (Tables 4 and 5). These data indicate that the parasitoid tends to generate a slightly higher number of individuals per day, which is an advantage if analyzed as a potential biological control agent because it could maintain the latania scale population at a low level. Generation time, the mean time between two successive generations, proved to be significantly higher in latania scale (72.34) (Tables 4 and 5) and is interpreted as an advantage for increasing the parasitoid population (La Rossa et al., 2002). On the other hand, since life table parameters can vary depending on the different species breeds (Stenseng et al., 2003; Liu, 2007), it is essential to have an exact classification through molecular characterization. This technique is highly effective to correctly identify parasitoids and Diaspididae (Pinto et al., 2002; Morse and Normark, 2006). Complementary to this, applying predictive models through population growth simulation that considers abiotic mortality factors, alternative food consumption, and migrational or competitive shifts (Flores et al., 2001; Barron, 2007; Gutierrez et al., 2008) will allow to determine the most biologically adequate parasitoid on latania scale for subsequent massification and release in affected crops. Aphytis diaspidis reached the highest parasitoidism rate when the 3rdS of latania scale was used, whereas no parasitoidism was recorded when H. lataniae individuals from the 1stS were provided. In the same way, it completes its development from egg to adult in this stage and has a 56% survival rate. Therefore, in field releases, successful scale control will occur mainly the 3rdS prevails. Latania scale had a higher net reproduction rate (R0) and generation time (T), but a lower intrinsic growth rate (rm) and finite growth rate (λ) than A. diaspidis. The parasitoid had a higher intrinsic growth rate, lower generation time, and the capacity to produce a higher number of individuals per day than H. lataniae, which indicates a high potential of the parasitoid as a biological control agent under field conditions. We wish to acknowledge the FONDEF D03I1077 and FONTAGRO FTG-32/03 projects that financed part of this study, the Comité de la Palta Hass for facilitating access to its members' crops where the material for this study was extracted, the CREAS (Centro Regional de Estudios de Alimentos Saludables) for its sponsorship, to the professionals Renato Ripa and Sharon Rodriguez, and especially to support staff Antonieta Cardemil and Alejandrina Ubillo for their collaboration. Finally, special thanks to Paulina Bermudez for her thorough revision of the manuscript.